Greenham Common Trust has granted £9,000 to Newbury Weekly News towards the Digital Archive Heritage Project. 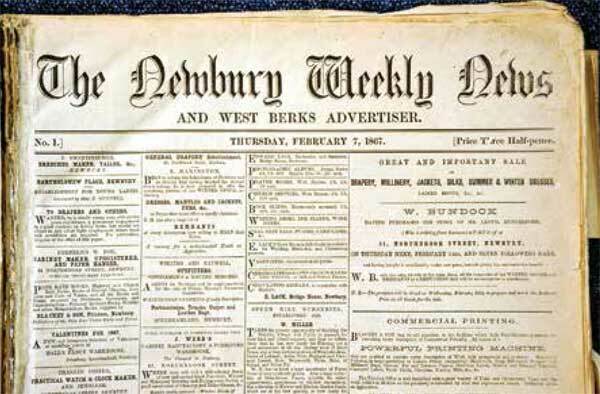 Funding is needed to digitise the predominantly paper archive of the Newbury Weekly News. The archive chronicles the history of West Berkshire from 1867 onwards, covering a time of huge social and economic change, as well as massive historical significance. Unfortunately, as the newspapers are now nearly 150 years old, they are starting to seriously decay and are in such a delicate state that they cannot be made available for members of the public to access. If they are not digitised they will eventually be lost forever as vital historical documents. A company in Norway, highly experienced in digitising newspaper archives, has been approached and the paper is now aiming to raise the remaining £50,918 required for the project after the Trust has match funded the Newbury Weekly News’ contribution of £9,000. Once digitised, the archive would be of considerable benefit to the local community, particularly the many organisations and groups with an interest in local and family history, as well as schools and colleges. Currently the newspaper archive is accessed either by bound hardcopy, which is heavy, unwieldy and fragile, or on microfilm using an outdated and erratic reader. There is no index and locating relevant items is a challenge. Also, photographs do not reproduce well from the poor quality microfilm. The archive contains coverage of historical events - both local and national - in degree of detail seldom found in present-day news media. There is much to fascinate and interest scholars, historians and ordinary members of the public. By digitising the archive, local history will be preserved for the benefit of future generations. By giving members of the public online access via the Newbury Weekly News’ website www.newburytoday.co.uk, the digitised archive will be searchable and researchers will not have to be in Newbury to do so (at present they are obliged to make a visit in person to Newbury Public Library to use the public microfilms). Many people researching their West Berkshire family history do not live locally and digitisation would enable them to access the records from wherever they are in the world. To view the full application and to make a donation to the Digital Archive Heritage Project go to www.findmeagrant.org, choose West Berkshire, and type WB11136 into the search field. The Trust will match fund all public donations up to a total of £5,000.